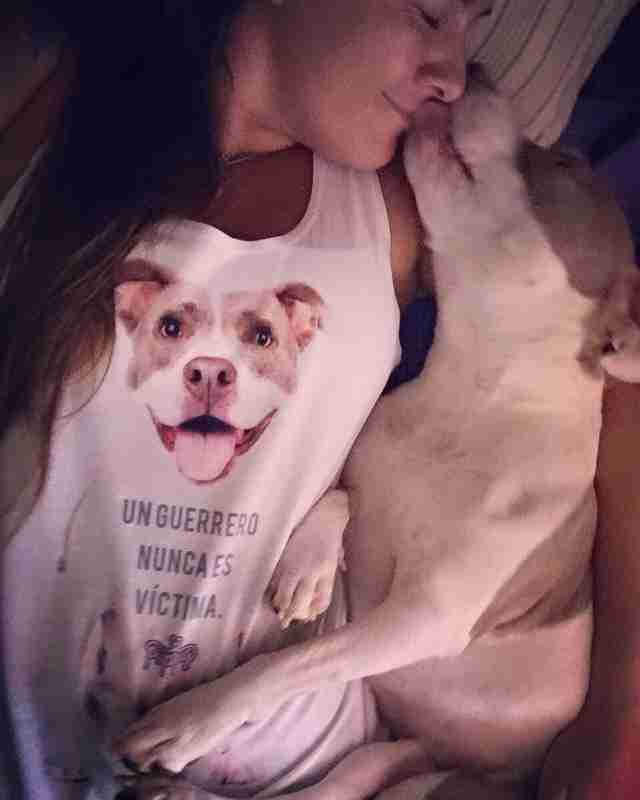 Marcela Wedel was in no position to adopt another dog. 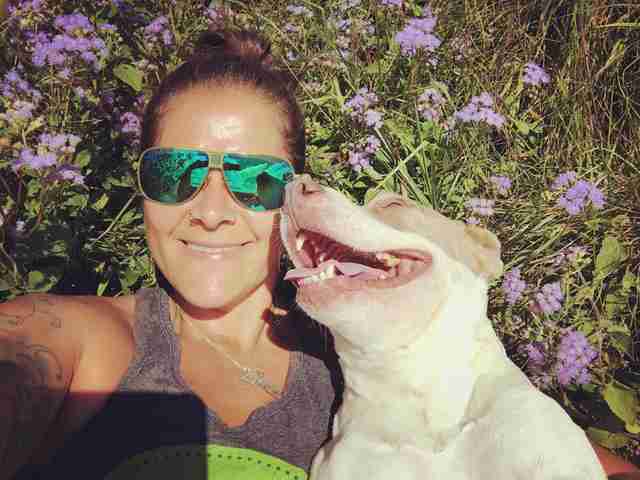 She already had four rescue dogs in her care, and she was stretched for time and finances. 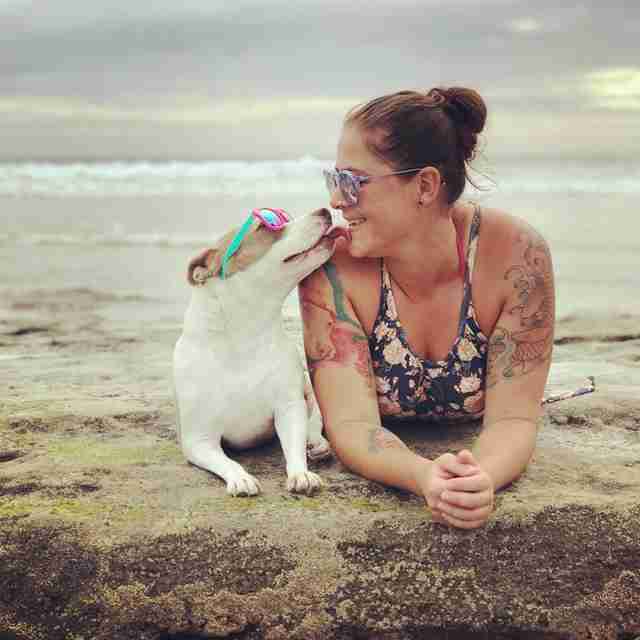 But when Wedel watched a rescue dog named Maia give birth to a litter of puppies, she fell in love with the tiniest one — the one she’d name Puppy Grey. 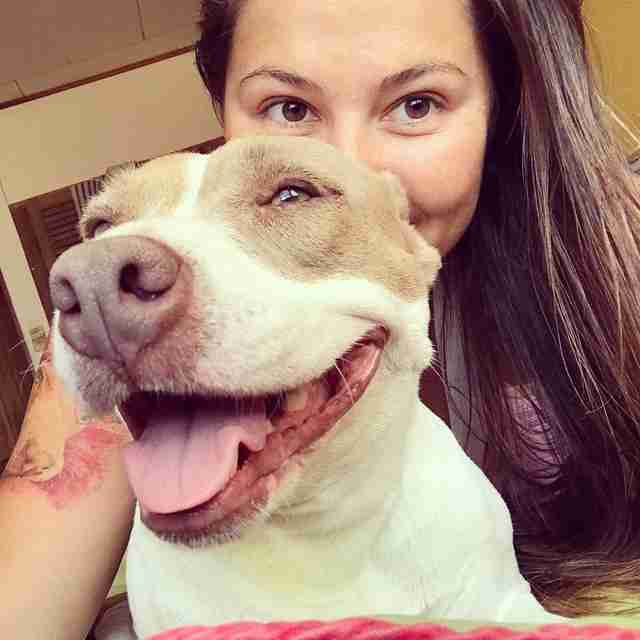 Six years ago, police rescued Maia and two other pit bulls from a drug lab in San Jose, Costa Rica. 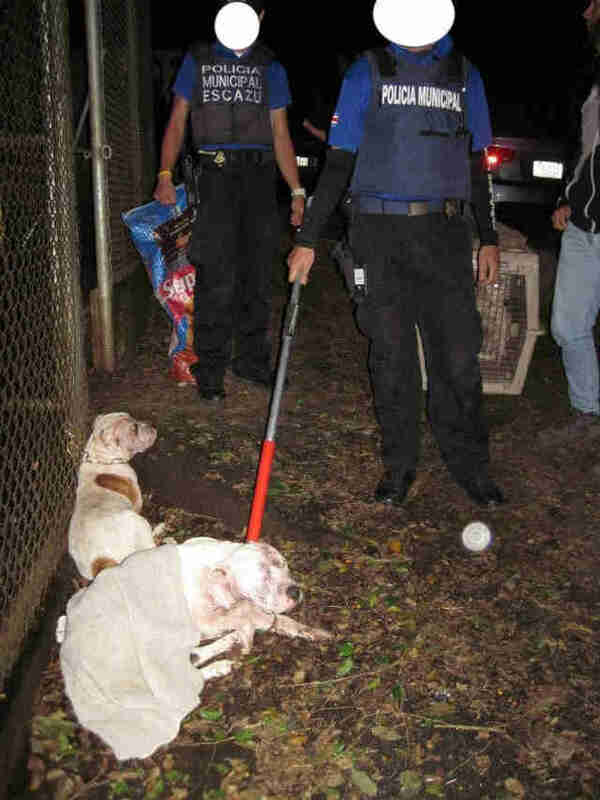 The dogs were chained up on the property, terrified and covered in blood. It’s possible they’d been used as guard dogs or in dogfights, although no one knows for sure. 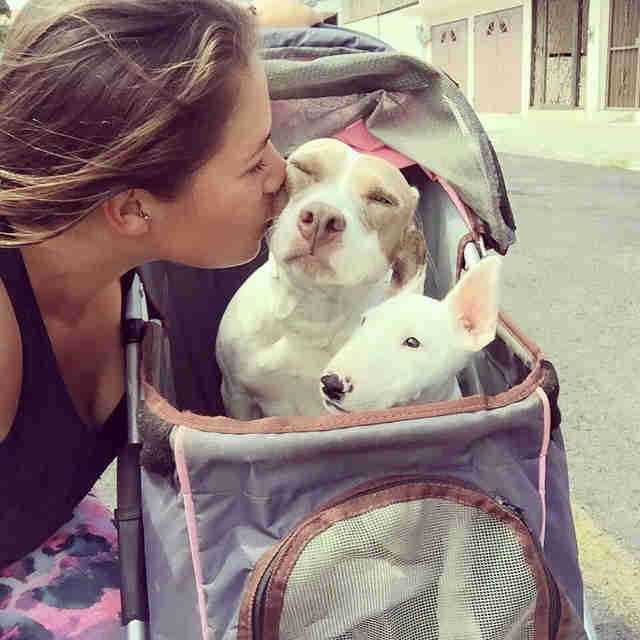 After being rescued by the police, the dogs went into foster homes — and Wedel’s friend was the one who took in Maia, who was heavily pregnant at the time. 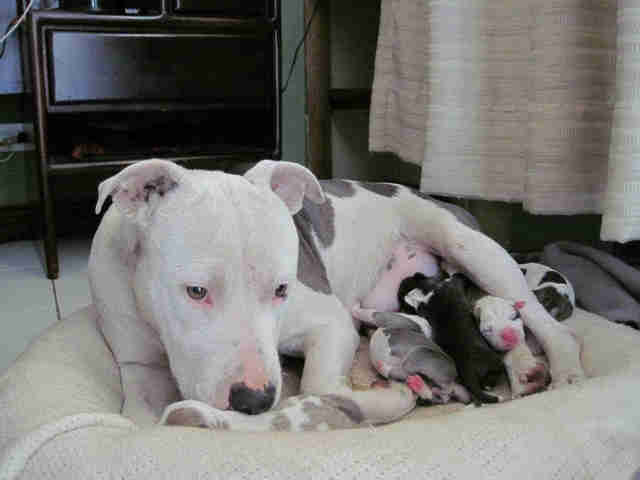 Two weeks later, Maia gave birth to four puppies, including Puppy Grey, who was the runt of the litter. 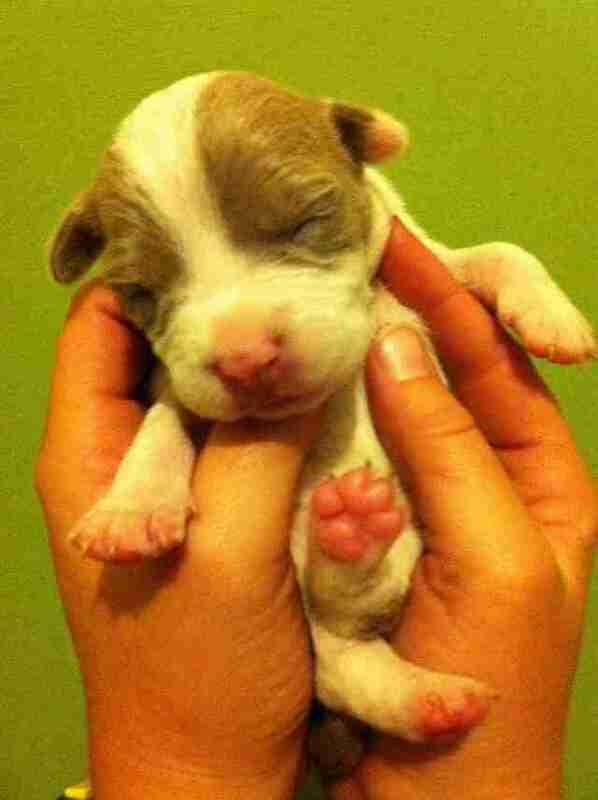 It quickly became apparent that Puppy Grey was different, and not just for being the runt. When her three siblings started walking, Puppy remained immobile. She also didn’t grow as quickly as the others, which led Wedel to suspect she had a type of dwarfism, although this has never been officially diagnosed. 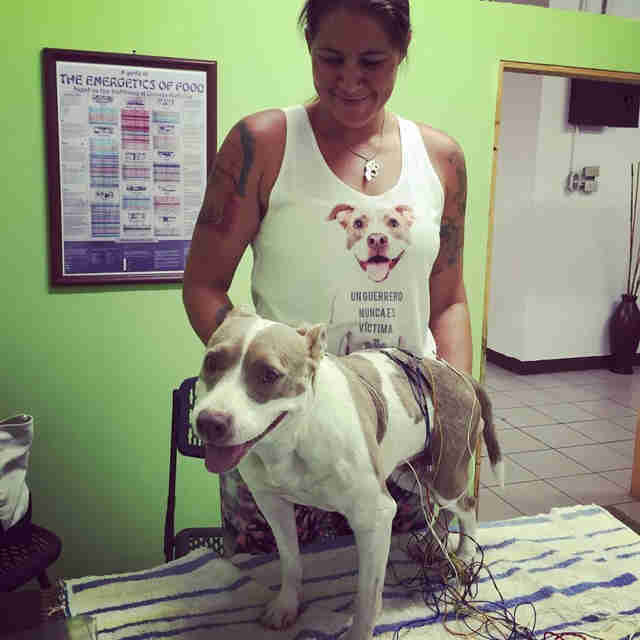 When Wedel took Puppy to a vet clinic to investigate her mobility issues, she got some bad news. The vet said that Puppy had a neurological problem, and suggested putting her down. Wedel refused. 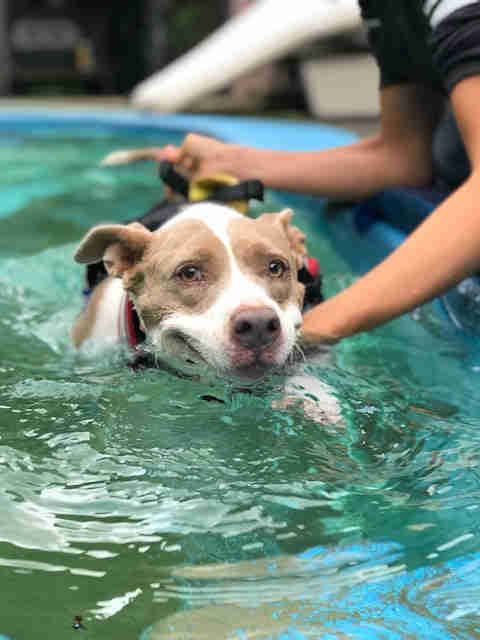 Instead, she started helping Puppy Grey do therapeutic exercises each day, took her swimming and got her regular acupuncture treatments. And slowly but surely, Puppy Grey started moving on her own. Around the same time that Puppy started to walk, she also started to smile. 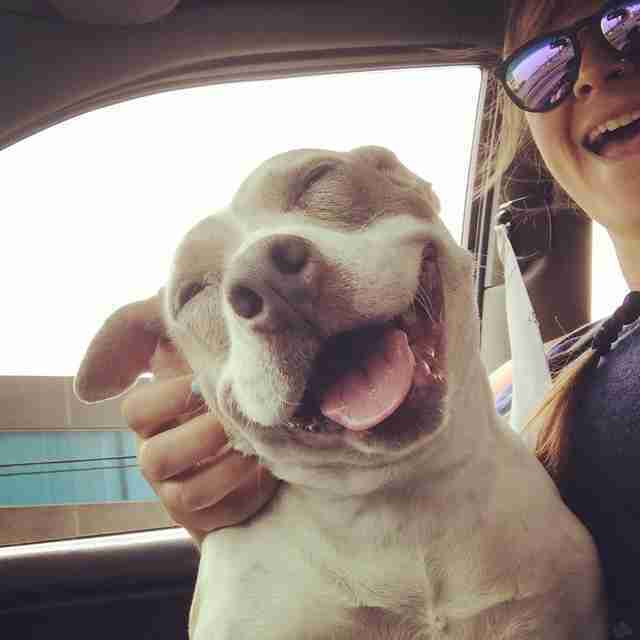 For about three years, Puppy Grey led a relatively normal life — she needed constant physical therapy, but she was able to move around on her own. But one day, she suddenly stopped being able to walk. 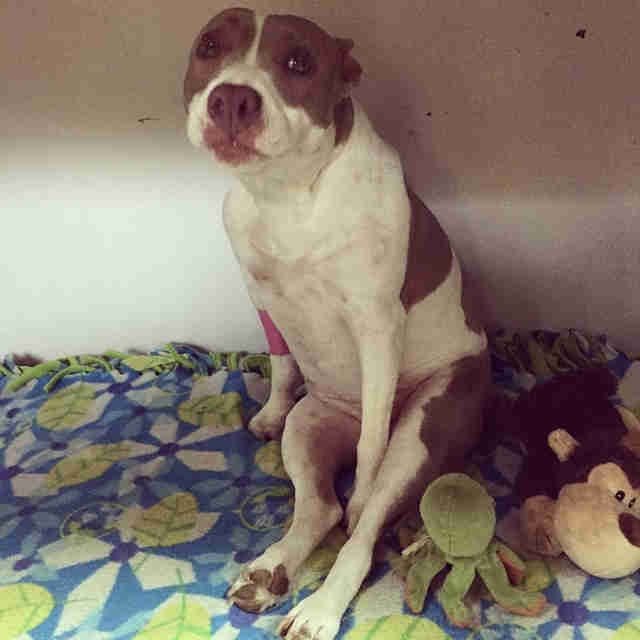 When Wedel rushed her to the vet, Puppy was diagnosed with a hernia, and the vet said she needed emergency surgery. Unfortunately, the surgery didn’t fix anything, although Wedel says it was not the vet's fault, and Puppy Grey’s lower body was paralyzed. Now Puppy Grey needed even more assistance moving around, and Wedel had to start helping her poop and pee. Wedel admits that caring for Puppy Grey is often challenging. For one, it’s hard for Wedel to pay for everything — Puppy Grey’s therapies cost about $500 each month. Secondly, Puppy’s condition means that Wedel needs to be with her every single hour of the day. “If I go somewhere I need to know that she can come with me, and if not, I probably won’t bother going,” Wedel said. Puppy Grey’s care has also taken a toll on Wedel’s own health — she gets sciatica and back pain from having to carry Puppy Grey around. Yet Wedel wouldn’t have things any other way. 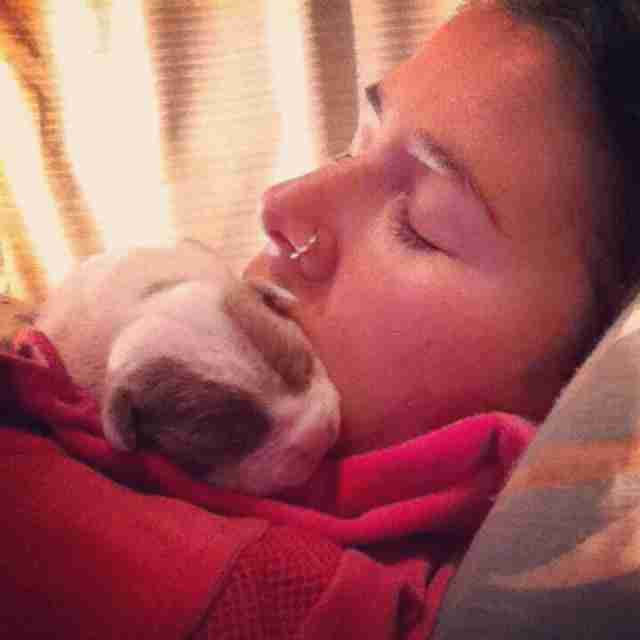 She loves taking care of Puppy, and she bends over backwards to give her everything she needs. To help pay for Puppy Grey’s treatments, Wedel teaches yoga and pilates classes. 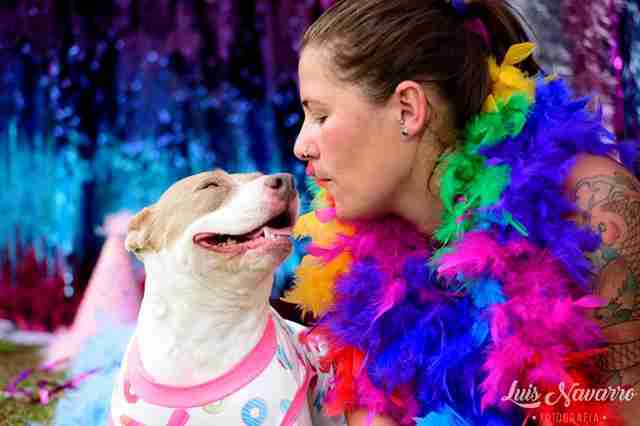 She also sells T-shirts, bags and other merchandise, all emblazoned with Puppy Grey’s infectious smile. If she’s really strapped for cash, Wedel will auction off her own possessions to pay for Puppy Grey’s care. Wedel also spends time sharing the joy of Puppy Grey with the rest of the world. 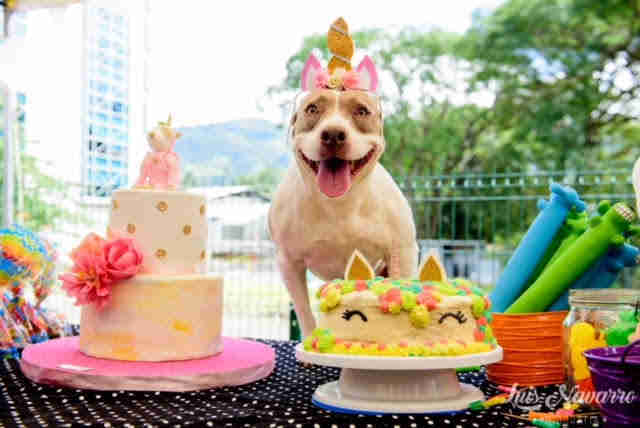 She set up a Facebook page for her, which has over 20,000 followers, and she throws a big party each November to mark Puppy Grey’s birthday. This year, Puppy will turn 7. 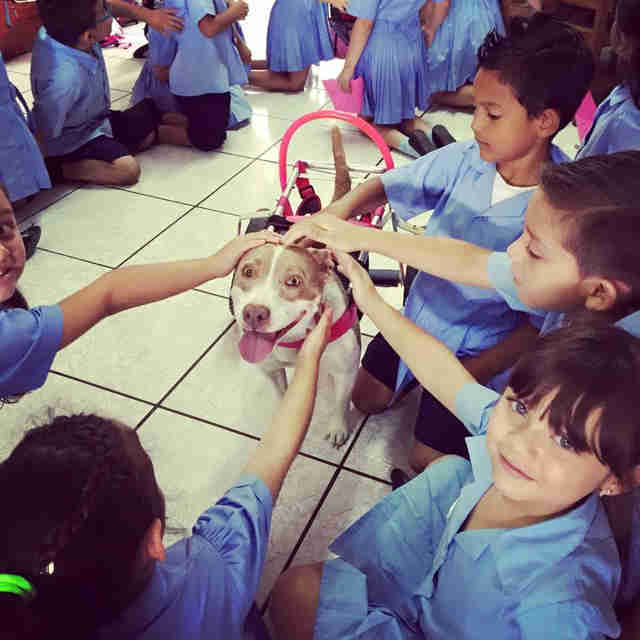 Another thing Wedel does is take Puppy Grey to local schools, so kids can learn about pit bulls and special needs dogs. 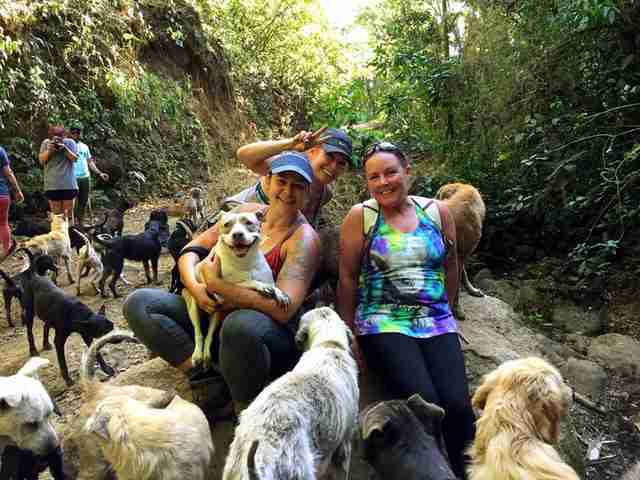 Besides Puppy Grey, Wedel takes care of eight other rescue dogs, and for the last nine years, she’s volunteered at the Territorio de Zaguates, a Costa Rican sanctuary for over 1,000 stray dogs. Of course, Puppy Grey always accompanies Wedel to the sanctuary. 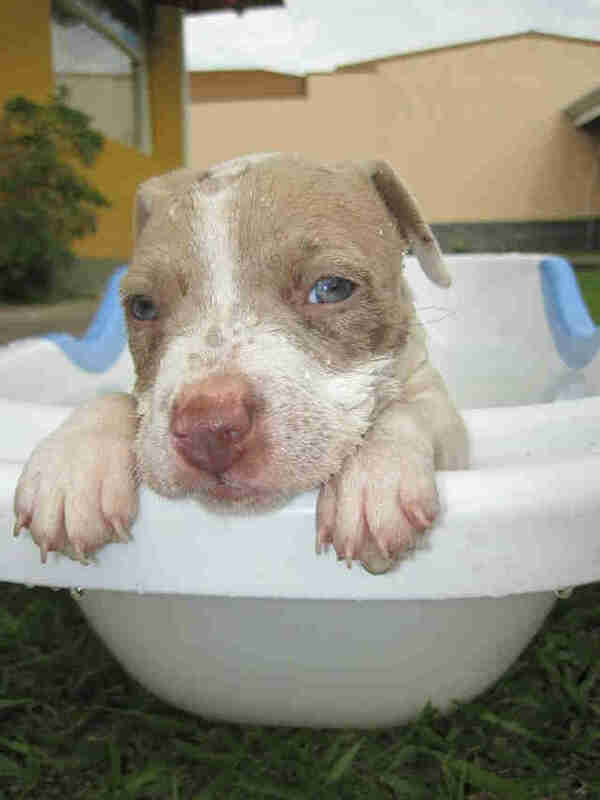 Puppy Grey’s health issues continue, and Wedel is hoping to get her to Florida where she can see a specialist. To help make this happen, you can make a donation to Puppy Grey’s medical fund.